i’m not talking about eyesight. i’m talking about the vision we would have for life and especially the church. i’m astounded by the number of people who are extremely successful in their fields, and yet they want church to just stay the same. maybe they had an experience when they were younger that moved them and so they want to stay in that place. maybe they find comfort in the church. i wonder how that same plan would work in their business life? if they had no vision or ambition of being innovative or the best. how long would they be successful? why is there the need for church to remain the same. i often think in a hectic life that people view the church as a constant. a constant where they can come and be comfortable, but i don’t think that God ever promised us comfort. but man will people ever fight for it, they even often demand it. i guess it’s different for me. i envision a church that is continually changing and morphing into something new. i dream of fluidity. where we are doing one thing one moment and then we discard it to do something different. i’ve never really found comfort in any church, i’m comforted by my relationship with Christ, but the church has hurt me too many times to ever feel comfort. and there in lies the problem, like children who just take their toys home because the rules or the game doesn’t suit them, we continue to fight the things we don’t like about church. some church hop to a place that will meet their needs or pander to them temporarily, while others stick around and make others miserable with their complaining or bullying. 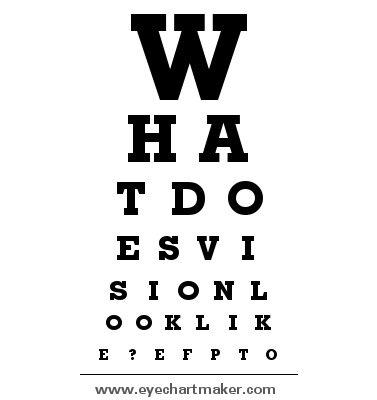 so what does it mean to have vision? how can you have vision in one area of life, but not another. the bible says that without vision, the people will perish. do you think it’s because people are scared? they’re scared that if they truly give their lives over to God that it will take them out of their comfort level? often they don’t seem scared to take a risk in business. they seem to be adrenaline junkies in certain areas of life. i guess it comes down to this TRUE GOD IDEAS are scary, because when God is in control, He takes away the comfort. following His dream is really living, but it’s dangerous to dream God sized dreams. it’s really easy to have a plan and be in control as a visionary when life belongs to you, but it’s not that easy when your life belongs to God and you give it over to Him. then things get shall we say a little more interesting. often to live that idea out we have to risk, and we are feeble creatures not willing to risk and relinquish control even when that control itself is an illusion. i love this quote from the Ethiopian founder of WorldSpace, the company that created XM radio. he saw his people dying due to ignorance and lack of information, so he left his job, his security, everything. so what about you? do you have vision? do you have a dream? is it a God sized dream? can you see past the things of this world to the things eternal? are you living for yourself and for your comfort? or do you see the bigger idea? do you have kingdom vision? how many organizations have i been a part of where all we remember is “the good old days” or where people have said things like “if it ain’t broke, don’t fix it”. i’ve always been under the auspice of break it and try to fix it. move forward towards change at all cost. shouldn’t we as believers continually be moving towards something bigger than ourselves instead of creating “safe havens”? so we ask God to give us the dreams He has already prepared for us. we don’t dwell on the past and a the victories of yester year, but we are in perpetual, continual forward movement. that is why we were created.